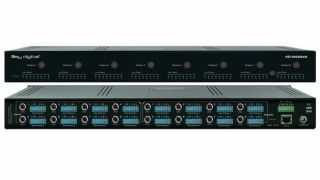 The What: Key Digital has launched the KD-MAX8x8 eight-input to eight-output audio matrix switcher with built-in audio DSP. The What Else: The KD-MAX8x8 features analog and digital connections per input and output. This matrix switcher enables analog-to-digital or digital-to-analog conversion of signals, or can operate as two independent audio matrixes (one digital and one analog). Analog audio inputs are connected on balanced/unbalanced six-pin phoenix terminal blocks, accommodating input signals from audio sources such as set-top boxes and music players in addition to microphone and professional audio sources. Digital audio sources are input on a PCM coaxial RCA connection that supports surround formats up to Dolby and DTS 5.1. Key Digital’s engineers have analyzed the core requirements for non-mixed audio systems such as bar and restaurant and residential distributed audio. Each output of KD-MAX8x8 handles all preamp functionality, enabling integrators to connect directly into simple amplifiers. Any of the connected audio sources may be selected on any output and apply variable signal processing levels for volume, bass, mid, treble, balance, and lip sync.